On snowy Sundays, we make doughnuts. It's delightful to spend a cold morning inside a warm kitchen that's filled with the yeasty scent of doughnuts. I have a hard time sleeping in on weekends, so I left Jamie sleeping under the warm covers and came downstairs to a quiet kitchen to mix up the dough and set it on the back of the stove to rise. 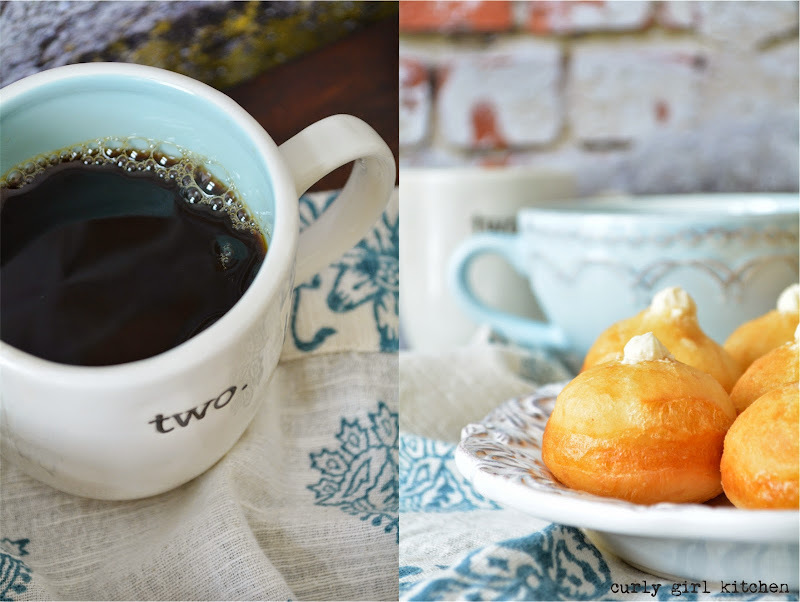 A cup of hot black coffee later, Jamie bundled up to shovel the driveway clean of its fresh blanket of snow while I rolled out the dough and cut doughnuts. 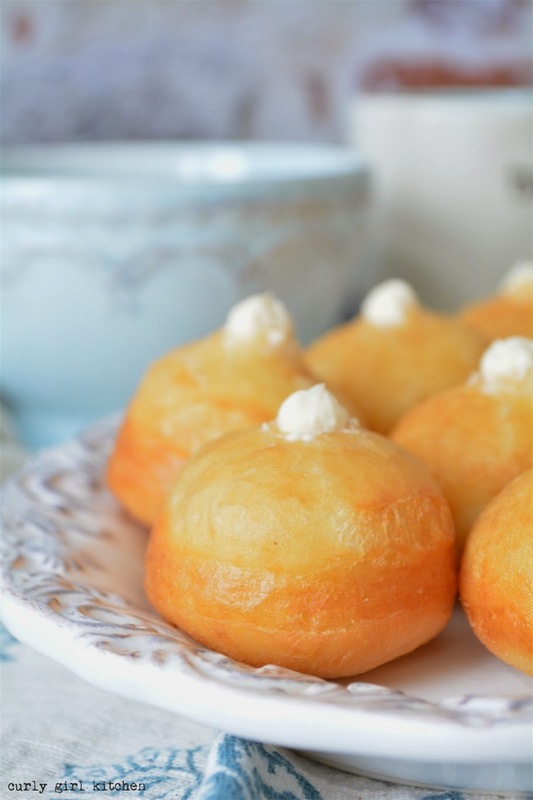 The doughnuts, fried golden brown and crisp, were plump, petite and pretty. 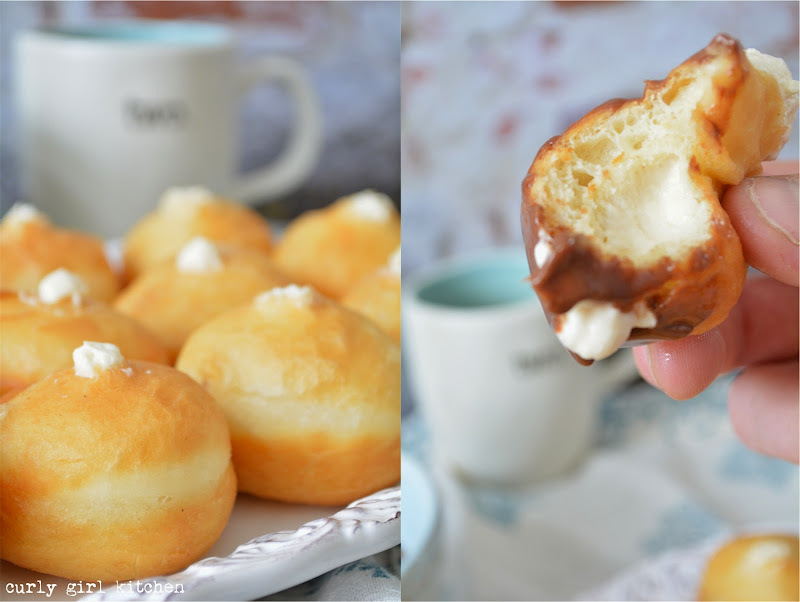 I filled them with whipped cream cheese sweetened with homemade salted caramel and then melted bittersweet chocolate into hot cream for a thin ganache for dipping. The ganache, with twice as much cream as chocolate, would never thicken enough to roll into chocolate truffles, and while warm, it was almost like a very rich cup of hot cocoa. 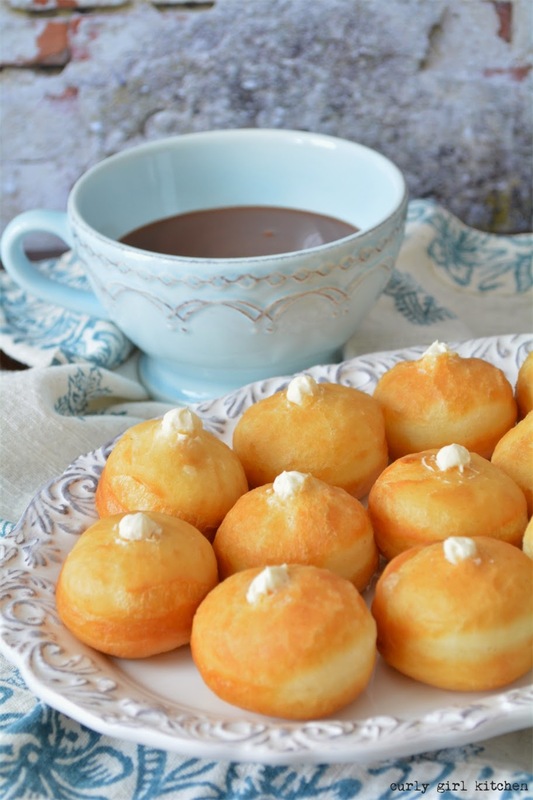 All together, the doughnuts have a surprising lack of sweetness, which I like about them, although you can always add a bit more sugar to the dough, or use milk chocolate instead of dark if you like yours on the sweet side. I cut the doughnuts small, because I think it's more fun to get to eat a lot of little doughnuts than just one big one, so we ended up with about 30 of these mini doughnuts. 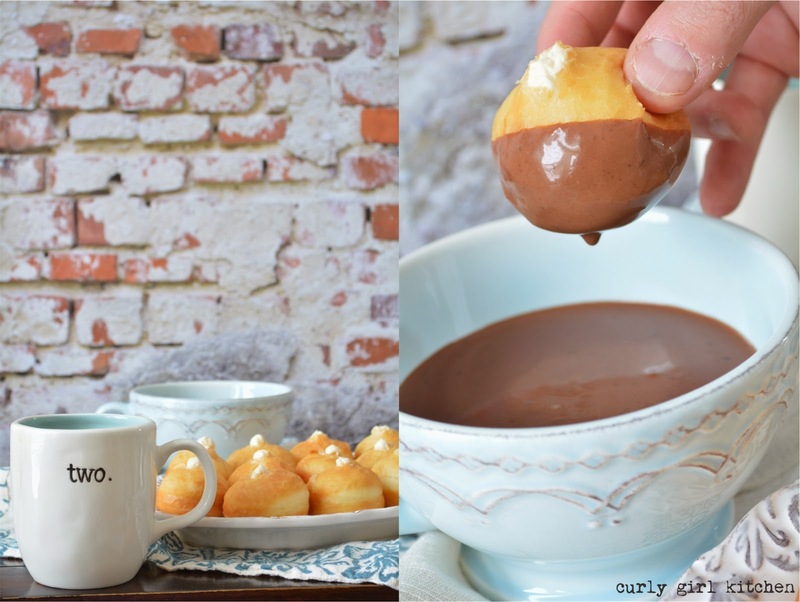 I spread the cooled ganache on the leftovers and chilled them, and cold from the fridge, they tasted exactly like cream puffs. With the mixer on low, add the butter, egg, salt, nutmeg and half the flour. Gradually add the remainder of the flour. Switch to the dough hook and knead on medium speed for 4-5 minutes, until the dough is smooth and starts to pull away from the bowl; it may be slightly loose and sticky but don't add more flour. Dump the dough into an oiled bowl, cover with a clean kitchen towel and set in a warm place to rise until doubled in size, about one hour. On a floured surface, roll out the dough to 1/2 inch thick. Cut out dough with a 1 1/2 inch round cutter, then gather up any scraps and cut those as well. Place the doughnuts on parchment lined baking sheets, cover with clean towels, and set aside to rest and rise again for 30 minutes. Meanwhile, heat three inches of olive oil in a large saucepan over medium heat, until the oil reaches 365F. Fry the doughnuts 5 or 6 at a time, for about a minute on each side, until golden brown. Drain on a wire rack and let cool slightly. For the filling, whip the cream cheese, cream and caramel with a hand mixer until thick and smooth. Scoop into a piping bag and pipe into the doughnuts. Heat the cream in a saucepan just until it begins to simmer around the edges. 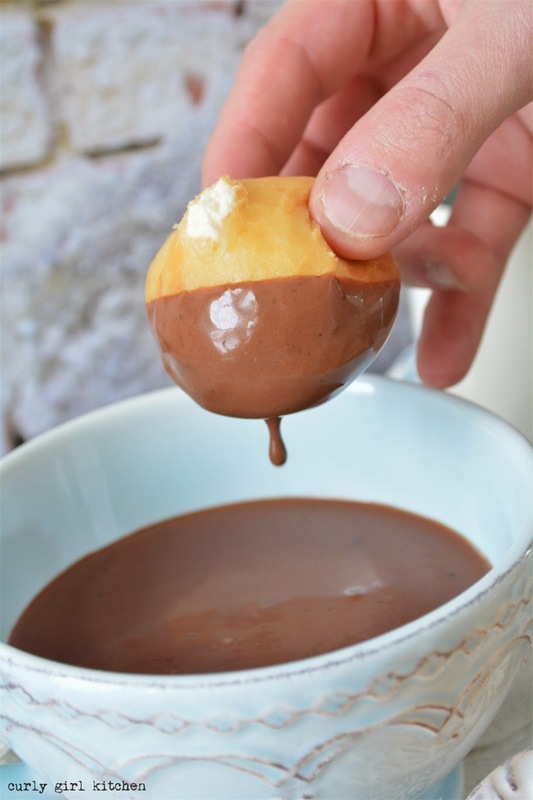 Remove from the heat and stir in the chocolate until smooth and creamy. Serve warm, on the side for dipping the doughnuts. If you have leftover doughnuts, chill the chocolate until thickened like pudding and spread onto the doughnuts. 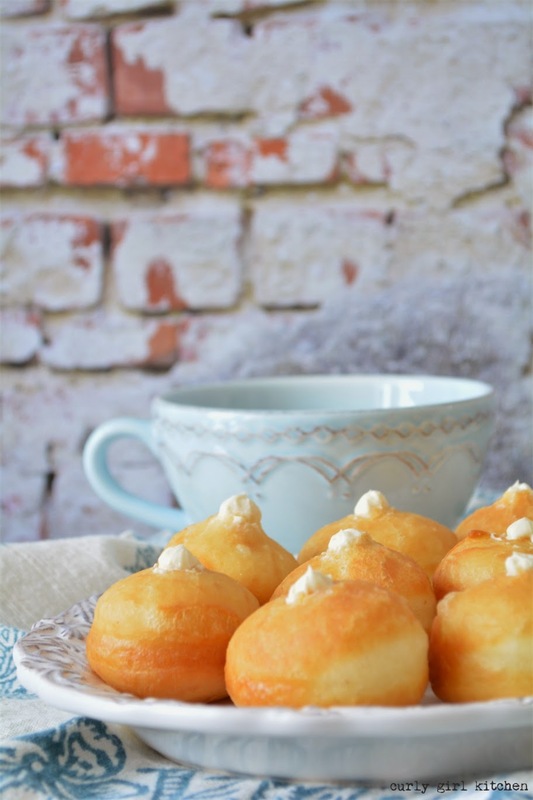 Store leftover doughnuts in an airtight container in the refrigerator; they will be good for up to one day, and when chilled they taste like cream puffs.